My Chinese boyfriend is usually the cook in our house and he can even make a few Finnish dishes as well! But sometimes (when he isn’t at home) I’ll cook my self too. 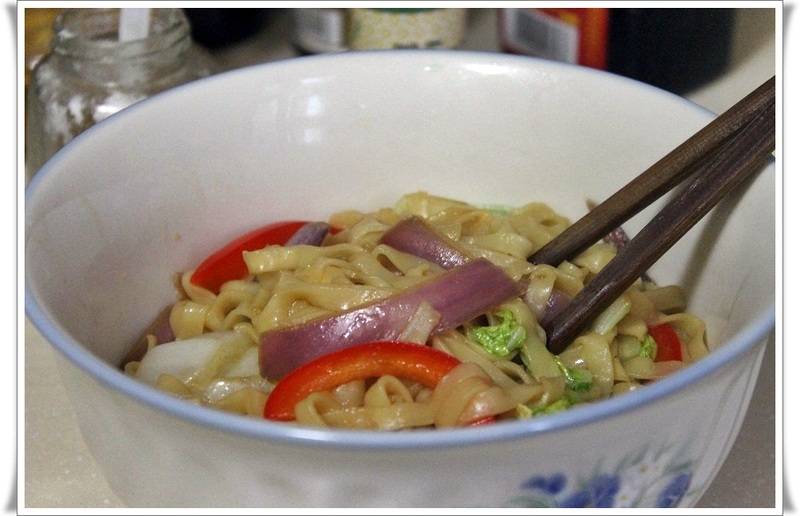 Recently I’ve been making a lot of fried noodles, which is an easy, but tasty meal. And cheap! Just few RMBs. 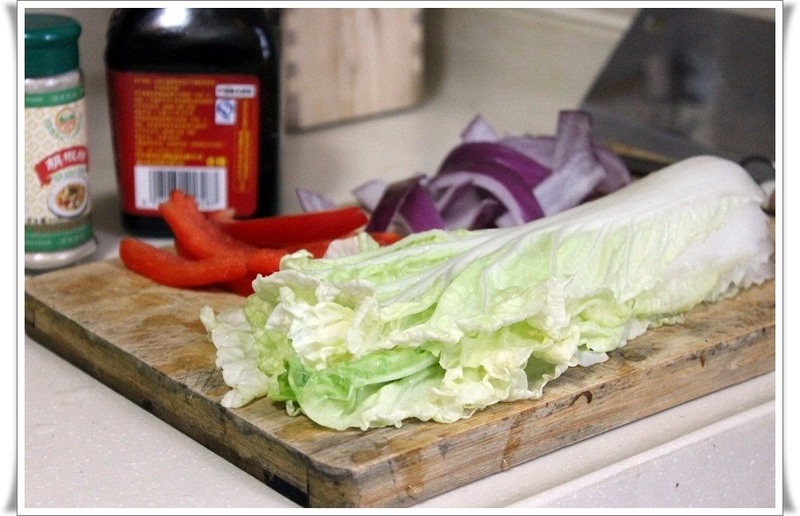 Cooking this dish takes only 10 to 15 minutes. I noticed that after coming to China and especially recently I’ve been eating much less meat. 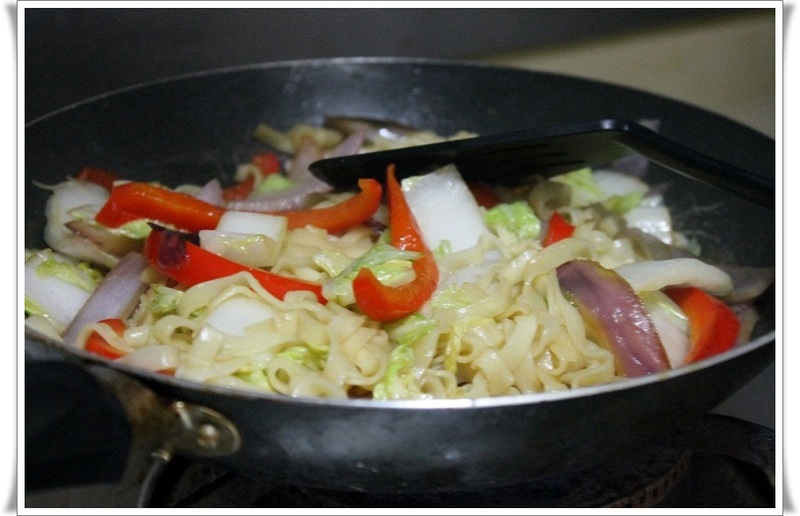 I make my noodles with onion, paprika and cabbage. I also love tofu, so often there isn’t a need to have a meat dish. And if there is meat, it’s usually just for the taste in a form of few slices in a dish. Cooking at home is great for someone in a student budget like me. The cost of this dish per one person is about 2RMB which is 0,24EUR or 0,32USD. For few slices of pork I would need to add 2-4RMB. These are the prices when you buy your vegetables and meat from outside markets. It might not be the most hygienic, but I’ve never got any problems even after eating meat that has been on the table on the heat for hours. I’m sure there are much better cooks among my readers, right? I should definitely get a photo of where I buy the meat and veggies! Cheaper in the supermarkets? I have exactly the opposite experience. Meet and vegetables are more expensive in the supermarkets, atleast that’s the case with my closest shop. well, your comparison is unfair.. the quality of the meat in wetmarkets is not as good as in supermarkets, I can even taste the differences. Also, if anything like food poisoning happens, you can sue the supermarket for compensation if you bought from supermarkets, but you can’t sue wetmarket owners (they change locations all the time, even you can catch the owners who sold you the meat which made you sick, they have no money to compensate you)..
I’ll think about it :) Perhaps I could get my boyfriend to cook some dishes and shoot them, his cooking is much impressive than mine. Your list sound pretty good already! I did forgot that I know how to make dumpling too, but that’s where my skills end. Finnish food on the other hand is so simple, that anyone could make it . The noodle dishes look so yummy! Here, we call the broad noddles kuey teow and Penang fried kuey teow is a favourite dish of Malaysians. Sara, you should use Wok instead of Pan for fried noodles…因为炒的时候, 火候很重要..